Arno uses his diesel torque to good affect on the hill climb race course. 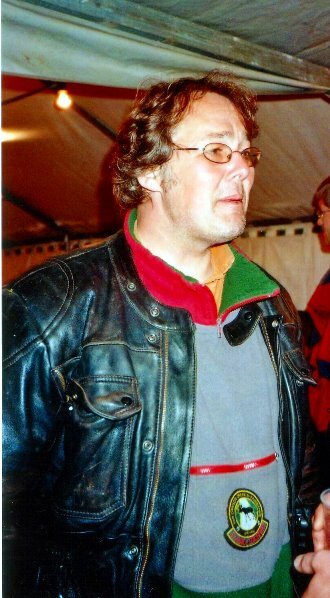 Many thanks to Arno Deuker for submitting this report of the 2009 rally at Gaschney. On Thursday I sent my family on vacations, Friday I mounted a new rear tyre and a support for the camera and after lunch I'm on my way to Gaschney (France)....I must be totally crazy to race with that bike but that is what makes it interesting! In the late Afternoon I arrive at the paddock after a relaxed ride. It is situated & quite lovely at the foot of a skiing ressort at about 1000 m height in the Vosges mountains. And it is busy there without being hectically. The technical control is going on and a walk though the paddock is a pleasure for eyes and ears. Most of the diesel motorcycles at the 2009 rally in Gaschney. A shot from the edge of the camping ground near the foot of the course up the hill. Some race preparations: I'm replacing a lost screw at the escape and Berhard is changing his footboards for small footrests and is tending his primary chain. About midday drivers communications takes place in French and German and I'm getting a bit nervous. The Diesel bikes are in the third group the first one is rolling down to the start (the paddock is uphill). 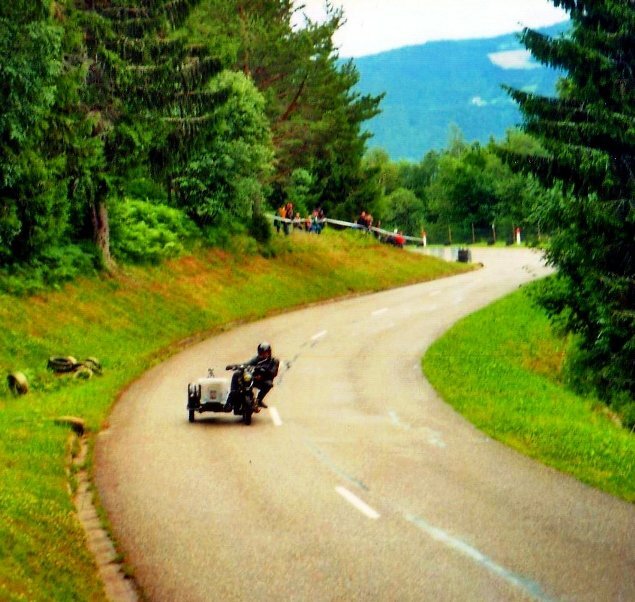 Than it's our turn ..... lots of tension...firstly all together downhill with "stopped“ Motor..I'm always afraid to cut the way of a solo motorbike with my sidecar. And then the start but see yourself: practice session there are lots of possibilities to do better. The first qualifying session than very embarrassing; by waiting so long with the clutch it is getting hot and just in the moment of the green light it is blocking and the motor turns off. The first 3 or 4 gear changes needs several intends too. And that in the moment when my fanclub (three friend from Palatina) arrived. Some more Diesel drivers arrive we are 7 now (+ a Hatz Dneper and the very huge Ebster). Jean and his Peugeot HDI superbike. You gotta love the French - we don't see them for years at the rallies and then they come along with a motorcycle like this and blow us all away. I'm sure you'll agree, a very nice machine indeed! The evening is getting long with red wine and live music to fight the cold. After a short night in the morning: rain and it should rain a bit time to time all over the day. Great: wet race. Some early tuning I am fixing a hammer on the frame of the sidecar in order to avoid to get under the brake with my toes while moving around on the sidecar. Wake up for the second qualifying session Adrenalin is eliminating the sleep 3:16 it's getting better time to time I don't have to gear down in the curves and to run with the momentum (diesel drivers first losses their lives before loosing speed) but still some problems at the start (a diesel is not accelerating but it is augmenting speed step by step) Before lunch than the first run 3:11- not so bad. But I am reaching my limits, in the big turn left the rear wheel is loosing grip...... In between the runs I have some time to look what the race sidecars are doing. Quite spectacular they must be crazy seen the speed they have, look at this: 1 2 3 4 5 6 7 8 9 10 11 12 13 14 In my pauses I am talking about my bike and my project in three laguages. It is a very relaxed and family event worth visiting it. Then the second run in my opinion the best. And once again 3:11 a bit faster than Bernhard and just behind Roland. It is afternoon and I have to pack my luggage. The fun run I am leaving out my shoulder aches a bit and with all te luggage on wet road, no thanks. At 18:00 begins award ceremony and it is a great surprise for me: I won the race it being on regularity &not on speed? (I didn't know). My way home was without problems and not too wet. Well, you never know when you might need one do you? Many thanks to Arno for his article.